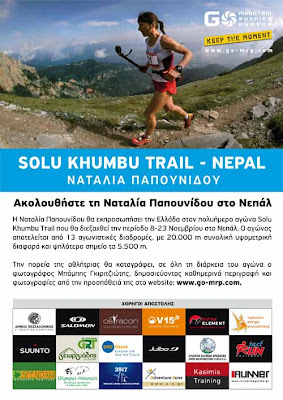 A year ago the leading Greek mountain running athlete Mr. Nikos Kalofyris participated in the challenging mountain race named “Solu Khumbu Trail” in Nepal winning the third place. 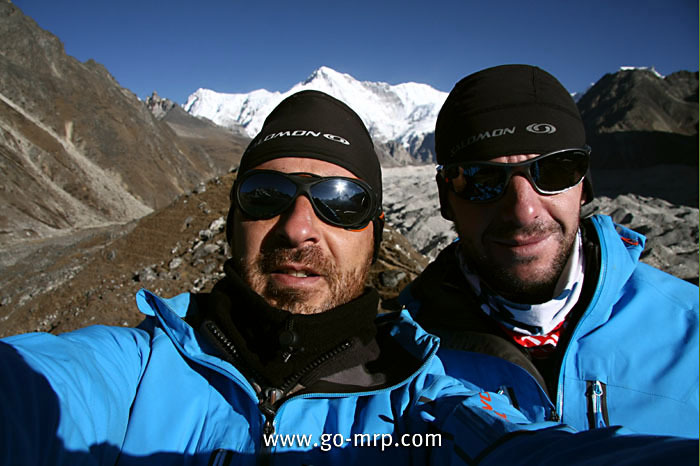 The photographer of the GO-mrp team, Babis Giritziotis accompanied the Greek athlete in Nepal and covered both photographic and journalistic the effort all the 13 racing days (étapes). This year Ms. Natalia Papounidou will participate in the same race, which won its participation via winning the first place among Greek women athletes who competed in the race Olympus Marathon in 2010. The photographer Babis Giritziotis will follow Natalia Papounidou covering, once again, the 300 km of the race on foot. His purpose is to record the attempt and send daily, using a satellite system, images and text to Greece. The athletes participating in that race are challenged to cover 300 km with a total 20,000 m altitude within 16 days. The race will start from Jiri and end in Lucla. Every day the athletes must cover 20 to 30 km on rough trails under very low temperatures. The "Solu Khumbu Trail" is listed among the most difficult races in the global calendar. The mission departed from Athens on 4 November and arrived in Kathmandu on November 5.The start will be given to Jiri on November 8 at 1,950 m altitude and the second day the athletes will go through 3,530 m (Lamjura La). For the next day the race will be between altitudes of 2,040 m and 3,500 m, so that athletes can acclimatize to continue at higher altitudes. After the fifth day of the race until the end the altitude will be around 3,800 m and will exceed at least twice the 5,000 m. The highest point of the race is around 5,000 m in Lac Gyazumba. The finish line will be crossed in Lukla village. From there all the athletes will fly to Kathmandou, after a brief ceremony in honor of Dawa Sherpa (organiser). The people of the DKG Group mentally and financially support the effort.